Does this happen to you? You buy the fancy natural peanut butter, you open it up, and there’s about a half inch of oil on top. You try to stir it all together and get oil all over your hands and counter and despite your best efforts, the peanut butter is still dry and rock hard by the time you get to the bottom of the jar. 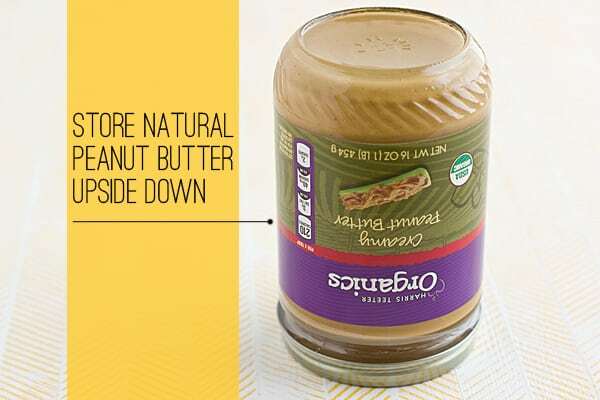 Solution: before you open your jars of peanut butter, store them upside down. That way, the oil will float to the bottom. When you’re ready to use it and turn it right side up, it’s much easier to stir without that layer of oil on top. Ginger is a pain to peel. It’s too small for a regular peeler and using a paring knife is tough without cutting off all the little branches and knobby little protuberances. (Can we nominate “protuberance” as one of the ugliest words in the English language?) Solution: use a spoon. 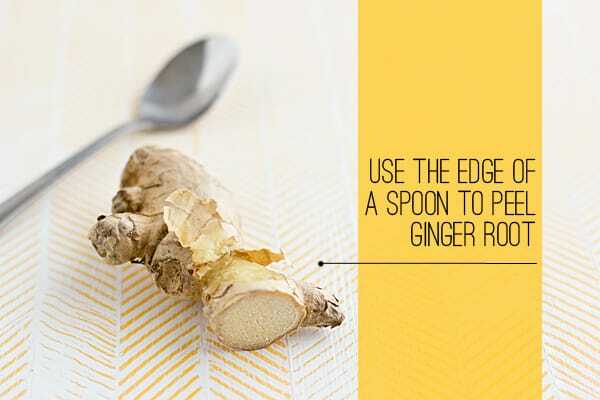 Yes, you can peel ginger with a spoon! Just scrape the skin right off with the edge. 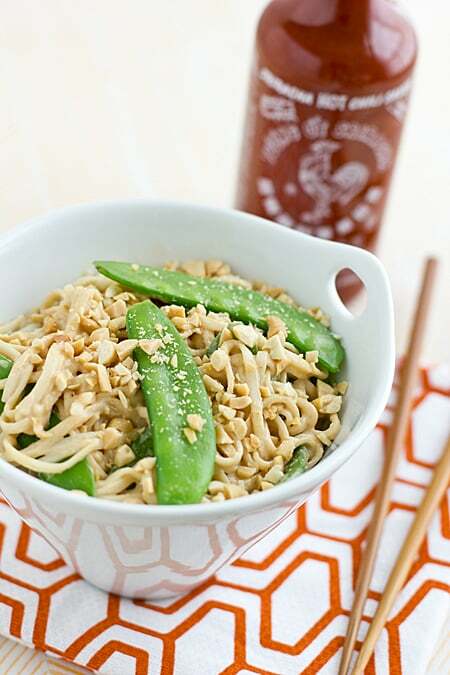 These flavorful Peanut Udon Noodles can be served hot or cold, so they make a great lunch. Add more red pepper flakes or sriracha if you prefer your noodles spicy! Cook udon noodles according to package directions. One minute before cooking time ends, add snow peas to pot. Drain and set aside. Add noodles and snow peas back to pot. Stir in peanut sauce. Serve topped with roasted peanuts and additional sriracha, if desired. I am not particularly a fan of peanut butter (gasp I know) BUT I do love it this way! Pass me a pair of chopsticks please. I am making this right now and it smells wonderful! I love your blog and all the great recipes! I have tried several already and they are all top notch! Thank you for your comment! 🙂 I hope this recipe turned out as good as the others! I have always been a fan of peanut noodles. I am excited to try this recipe! Good tip about the natural peanut butter! I have some discounted pb from the import store I need to use fast and this sounds really good. Such great tips. I didn’t know about turning the peanut butter upside down. Recipe sounds really good. Delicious! I used organic mung bean fettuchini noodles from Earth Fare, and they worked amazing! The noodles had 20 grams of protein per serving which made this meal even more protein packed! Ooh, I’ve never seen those noodles before! I’m going to have to look for them next time I’m at Earth Fare. Have you tried this with almond butter? I ask because I have a jar and have no idea what to do with it because it turns out almond butter is gross…(purchased during an ill-advised cleanse where I was supposed to go paleo…which can be awesome food, but I spent the entire time focusing on what I couldn’t eat and pretty convinced I was starving. Poor planning on my part). Oh yes, me too. I can cut down on carbs and sugar, but cut them out altogether? No. Bad things would happen. What type of noodle could I use instead of udon noodles? Rice noodles, soba, and lo mein would work too. I’ve even seen peanut noodles made with whole wheat spaghetti! Just lovely. Used soba noodles and stir fired with julienned carrot, spring onions, bit of fresh chilli. The sauce is wonderful, although I didn’t (and wouldn’t) add sugar. Quick and sooo tasty, will become a staple. Thanks for this recipe! I added carrots and an egg in the stir fry pan. Topped it with some mint. Delicious and healthy. Used soba noodles Looking so yummy. I love noodles. Thanks for sharing this amazing Recipe. Soba noodles are great, too!